Here’s a fun tutorial for the easiest snowman you and your children will make this winter! Use cheap cosmetic cotton rounds to make these jolly little bundles of snow, then use them to decorate your tree with this Christmas. You don’t need anything more than cotton rounds, pom-poms, felt, stickers and some thread. It’s a really fun craft to do with your children any time during the winter, not just at Christmas time. 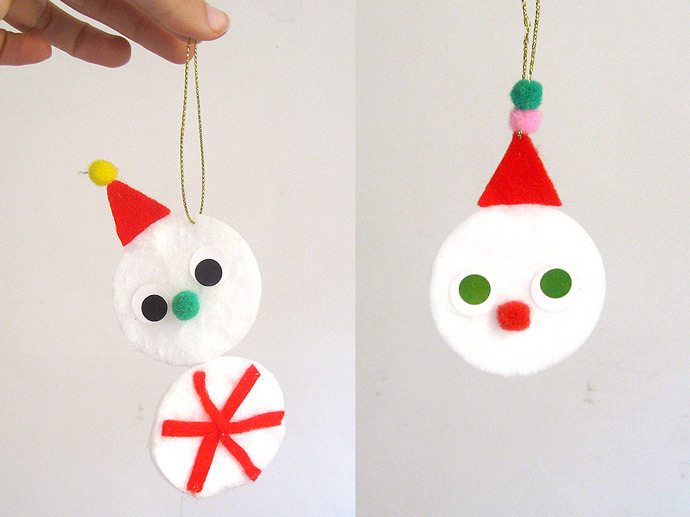 Encourage your kids to create different faces for their snowmen as they work with the felt and pom-poms. Set out two cotton pads and two pompoms. From your felt, cut out a triangle for the snowman’s hat and three, thin felt strips measuring the same diameter as the cotton pad. Take a needle and thread and string on one of your pom-poms, then the felt triangle, the top cotton pad, and finally, the second cotton pad. Pull the thread to tighten and stitch together. Place the felt strips on the body of the snowman, forming a star. Stitch to the pad. Stitch the 2nd pom-pom to the head of the snowman for a nose and make a knot at the backside of the pad for finishing stitches. Add small round stickers to bigger round stickers and place them on the snowman’s head for the eyes. You could also use buttons or googly eyes! String your snowman using your needle and a decorative gold string or yarn, then tie a knot. Your snowman is ready to hang! You can also simply make a snowball! For the snowball, string together two pom-poms and another felt triangle using a yarn needle and decorative gold string or yarn. With a sewing needle and thread, stitch the felt hat to the head of the snowball. Pass the needle and thread through the center of the head and stitch a pom-pom in place for the snowball’s nose. Add stickers for the eyes and make a knot with the two ends of the string to hang up your snowball! Make as many snowmen and snowballs as you want, combining different felt colors, stickers, and pompoms. You could embroider some cute embellishment lines, like zigzags, running stitches or straight stitches. You could also take a marker and draw funny faces on your snowmen! Enjoy a snowy, wintery time! Happy Crafty Holidays!